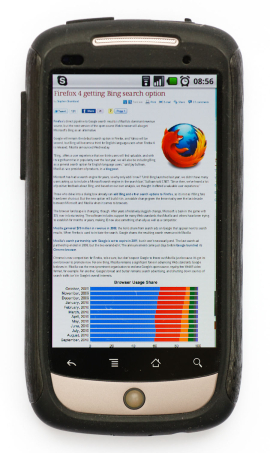 Mozilla, the company behind the smart and intelligent browser, Firefox, unveiled Firefox 4 beta for Android as well as Maemo devices. Mozilla brings in the great interface specially designed to fit Android handsets brings in the special feature known as Pinch-To-Zoom, which would be widely rival the iPhone capability. Various multi-touch devices will now give the users power of zoom on the finger touch. Furthermore, the beta version also brings in Firefox Sync feature which makes an instant change on the activity of the user. Changes made on the mobile Firefox will automatically appear on the desktop version, this is what the powerful feature of Sync provides. The sync activity applies to changes recorded over the browsing history, passwords, bookmarks, as well as form-fill data. Another great feature added to the browser is the Awesome screen which gives instant access to recent history, bookmarks and tabs. Earlier, the alpha version of the browser used the Electrolysis technique which made the browser run in a separate process. The beta version brings something new, the browser now works on layers, which the browser maker says that it improves overall performance and graphics areas including scrolling, zooming and animations.